Madden NFL 10 brings something for everyone. Experience first-hand what it’s like to “Fight for Every Yard” in Madden NFL 10 for Xbox 360© video game and entertainment system and PLAYSTION©3 computer entertainment system. With all new Pro-TakT animation technology, players have more control over the outcome of each play. Add to that the most immersive broadcast presentation and online innovation in franchise history; if you see it on Sunday, you’ll see it in Madden NFL 10. This year, Madden NFL 10 arrives on the Wii with breath-taking visuals that will captivate both seasoned veterans and new comers to the franchise. Completely redesigned and built from the ground up, Madden NFL 10 epitomizes what fun looks like on the Wii , delivering the most social and dynamic experience from the franchise to date. 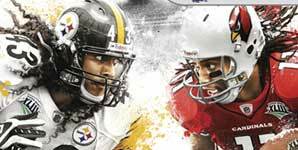 Quick, exciting game modes ensure that anytime is the right time for Madden NFL 10 on the Wii . The award-winning Madden NFL 10 franchise will be available on the Xbox 360 video game system from Microsoft, PlayStation©2 and PLAYSTATION 3 computer entertainment systems, Wii , and PSP© (PlayStation©Portable) handheld entertainment system. Madden NFL 10 will also be available for feature phones this month, and on the App StoreSM in September. Madden NFL 10 is developed in Orlando, Florida by the award-winning EA Tiburon studio, which also produces NCAA© Football, Tiger Woods PGA TOUR© and EA SPORTS MMA. EA SPORTS is the leading interactive sports software brand in the world, with top-selling titles and franchises including Madden NFL Football, FIFA Soccer, NHL© hockey, NBA LIVE basketball, NCAA© Football and Tiger Woods PGA TOUR©.